Get beach body ready at MyProtein with all the supplements you want and 35% off all bestsellers with promo code MAR35 and 10% off clearance products with promo code WINTER10. Offer is available for a limited time only. All orders over $90 ship for free. Quantities are limited so stock up now while supplies last. 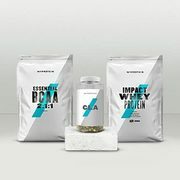 "Due to Canadian customs regulations, Myprotein products may be regarded as Natural Health Products (NHPs), resulting in a maximum amount of 90 days’ worth of an individual product type in your order. Ordering more may result in a delayed customs clearance and/or a complete rejection of your package. We recommend checking how many days’ supply each unit provides before purchase, especially in relation to powders and pills/capsules."